Still wrestling with my next post on error messages. Meanwhile, I’m sharing some excellent links on technical communications I’ve happened upon lately. Ten Reasons Developers Hate Your API (and what to do about it). Some great take-aways for anyone involved with APIs and their documentation here. And yes, terrible documentation is reason number 1 on the list. To cut resource-draining just-in-case material: Put each topic on trial. I have a couple of other tools in my belt for this already, but more are always handy. Similar to the 5 whys of root cause analysis. Survey on technical communications in Europe. Not so much a general survey as an attempt to figure out what the market would be for tekom activities in your country, but being from a country with barely any sort of relevant conference and training activity, I’m all for that. 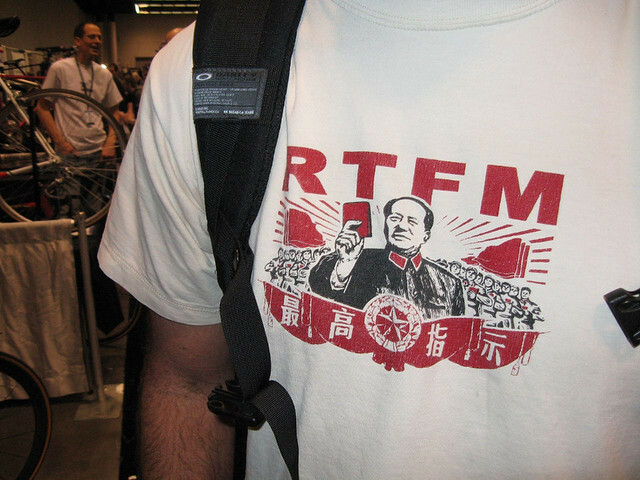 If you want them to RTFM …. Thinking this would make a good motivational poster for tech writers. Maybe even a t-shirt?